Although the season has started winding down after the high of Doheny earlier this month, the racing season never really ends these days… There were a bunch of events around the world in late October, and we’ve still got the Worlds next month before Aussie Downwind Week and the Paris Crossing in December. Over on Maui last week, Kai Lenny and Fiona Wylde took late-season wins at the World Series event, edging out a small but elite field in fun conditions that saw both a Maliko downwind run and a surf race at the windsurfing mecca of Ho’okipa. Connor Baxter struck first, claiming the downwinder on Saturday (October 15th) on the famous downwind run, a stretch of water he hasn’t lost a race on for about half a decade. 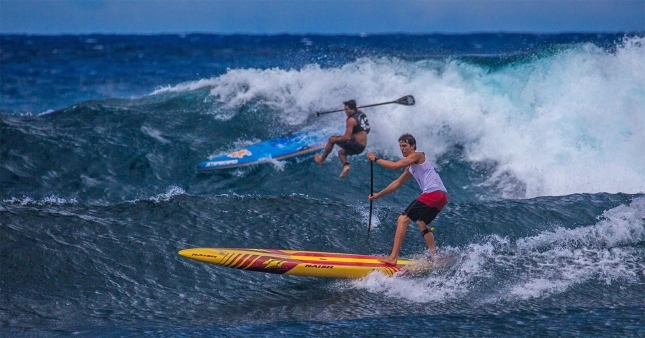 Kai was runner-up, while fellow Maui boy Kody Kerbox hit the podium in what will be his last World Series race (Kody said he planned to focus on studying next year, and will only hit a few of the major events in the U.S. instead of following the circuit). In the women’s event, where turnout was very small (an unfortunate theme we’ve seen at pretty much every single international SUP race around), Fiona Wylde was always going to be the one to beat, and sure enough the young star put on a clinic to claim opening day honours by a country mile. While there wasn’t a lot of action on the first day, Sunday certainly produced some entertainment, with a solid swell making the surf race at Ho’okipa Beach Park a worthy replacement for Turtle Bay (the original home of this event). After several rounds, in which the field was very slowly whittled down, it came to the elite final, where Casper Steinfath, who had a disappointing result the previous day, showed his explosive talents to claim the win ahead of an impressive Zane Schweitzer, Kai Lenny and a rejuvinated Slater Trout. Connor had a final to remember, finishing 7th, which pushed him down to second overall and handed Kai the event title. Side note: Casper won all three of the of the World Series sprints this year (Japan, Germany and Maui), however he only finished 3rd, 4th and 8th in the respective distance events. This highlights not only the fact that Casper is an amazing short course racer, but also that our sport is becoming more and more specialised; several athletes now focus entirely on a specific type of racing. In the women’s, Fiona Wylde made it a clean sweep, with only young Annie Reickert (a future name to watch for sure) getting anywhere close. The 2016 Series was shortened to just three events for the women (and four for the guys), which left Fiona on top of the standings to gave her a maiden World Series crown.